Supply Chain Agility: How Important Is It? Agility (or the ability to move quickly and easily) is a desirable trait in almost any situation ― particularly as it relates to the supply chain. As its name implies, the role of a supply chain is to not only insure that the enterprise has the proper raw material supplies to produce the final product, but in a broader sense to insure that the enterprise is nimble enough to meet customer demands in a profitable way. It is a philosophically simple concept, but difficult to execute on a consistent basis. Part of the difficulty comes from the constant pressure to reduce costs fostered in part by the results produced by supply chain managers during times of financial crises. These results may have caused an addiction by the enterprise to constantly reduce costs without reducing service levels. Let’s dive deeper into the goals, objectives and means of measuring the agility of an enterprise supply chain, which will help us better understand its importance. The ability to respond easily to opportunities (and inevitable problems) facing the operational side of the enterprise (manufacturer or distributor). From an opportunities perspective, this implies that the supply chain is able to predict and respond to demand especially when it is unplanned. The supply chain should provide a cost-efficient engine for growth formed by a solid infrastructure of both partnerships and technology platforms with the ultimate goal to continuously improve asset utilization. Items such as inventory and facilities make up the largest part of the enterprise’s asset base and are greatly affected by an efficient, nimble supply chain. From an execution perspective a large part of establishing a competitive advantage is having an efficient and agile supply chain that can support customer price and variety requirements while improving customer service. That support comes in the form of the supply chain’s ability to react quickly to changing requirements at the lowest possible cost. Speed – its ability to sense and react to change. Cycle times to capture or react to opportunities placed before it. Visibility of opportunistic situations (or its measure or sensing opportunities). Predictability – repeatability of response to opportunities / problems in the face of increasing demand volatility. Consumers are less predictable than in the past, in part because they have many more potential sources of supply. The variability of Cycle Time to execute or react to demand volatility. Demand intelligence or some reasonably accurate predictor of the load that will be placed on the supply chain. This of course means the enterprise needs a good S&OP process supported by a good forecasting system. This is becoming more and more difficult over time and enterprises must employ technology to remain competitive. Delivery flexibility – Production or outsourced supply ability to not only be turned on or off quickly, but to be able to produce at over capacity easily. Cost to run the supply chain itself. If costs are prohibitive, then a supply chain will resist opportunities or change. Quality – fulfillment performance is perhaps the most often measured item of a supply chain and is very important; but without the other measures, quality will never be realized. Perfect Order – on time and accurate, along with many other measures. Delivery performance traditionally represents order fill rates and on-time delivery. In some sense delivery performance is a subset of perfect order rate, which encompasses many measures. 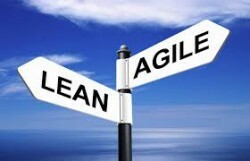 Supply chain agility represents the enterprise’s readiness to meet changes in the face of increasing demand volatility. That nimbleness in business – as in nature – is an important means of survival.